Abstract: The patient is a 21-year-old equine with a chronic history of hindlimb lameness. 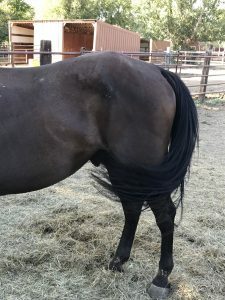 The horse is currently not used for riding but has had increasing periods of lameness while in pasture and more difficulty in tolerating hindlegs being lifted during hoof trimming. Dry needle acupuncture was used over a course of 3 weeks for treatment. The patient did seem to be eating better with no significant worsening of lameness since treatments started and the plan is to try to continue regular acupuncture and assess how horse tolerates his next farrier visit. History and Presentation: Munster is a 21-year-old Dutch Warmblood gelding with a chronic history of lameness due to a stifle injury at 8 years of age. The horse was diagnosed as a suspected cruciate ligament tear and was career ending for this individual so that the horse has not been used for riding since the time period of the injury. At the time of the initial injury in 2008, the horse was taken to Washington State University College of Veterinary Medicine and had a full workup (no arthroscopy) with no options for returning horse to performance or a rideable individual at that time. The patient has generally done well with comfort in pasture but has started to show more time periods of limited activity and lameness especially after high activity in the pasture. More difficulty has also been noted when lifting hindlegs for the farrier. The initial injury was to left stifle but horse now seems to have discomfort in both hindlimbs. The horse has never been treated with acupuncture but does occasionally receive phenylbutazone prior to hoof trimming. Physical Examination and Clinical Assessments: The horse is bright, alert, active, and ambulating on all four limbs on presentation. 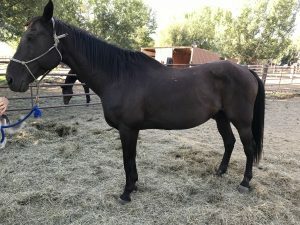 Body condition score for this horse is 2.5 out of 5 (owner reports horse has been more recently separated to ensure he is getting adequate feed which includes senior pellet and teeth also have been recently floated by a veterinarian). The horse ambulates with shorter stride in hindlimbs and mild bilateral varus in hindlimbs. There is decreased lateral flexion of neck bilaterally with no significant myofascial restriction palpable. No back pain or lumbosacral pain is noted on exam. The horse does not tolerate lifting either hindleg well with pain on flexion of right stifle greater than response to left stifle flexion. Medical Decision Making: The initial plan was be to address neck pain/lack of mobility as well as hind end pain with acupuncture. Additional involvement with owner homecare of stretching in the neck and hindlegs would be beneficial as goal would not be to make horse sound but to make him more comfortable overall and more tolerant for farrier to work on hindlegs. Neuromodulation of lumbosacral nerves as well as sciatic nerves that innervate stifles through use of acupuncture will likely be helpful. Centrally targeting L4-S2 (femoral nerve) as well as tightened cranial hip quadriceps and adductors (likely source of hindlimb varus during motion) could be beneficial. Differential Diagnoses: Differential diagnosis for hind end pain include vein or artery disruption due to trauma or disuse (decreasing circulation to hind end), infectious causes include joint infection, central nervous system infection (such as EPM), and neoplasia. Degenerative differential diagnosis includes osteoarthritis of stifles and/or hips, toxin exposure leading to neurological dysfunction of hind end, and congenital abnormalities (conformational problems with hindlimbs, osteochondrosis). Autoimmune disorders that affect musculature (myositis), traumatic injury to stifle joint (cruciate ligament tear), muscle or ligament injury to hindlimbs, and endocrine/metabolic conditions leading to weakness/lameness (Cushing’s disease/equine metabolic disorder) should also be considered. Myofascial dysfunction in hip/quadriceps and neck are also on differential diagnosis list. Definitive (or Putative) Diagnosis (or Diagnoses): Osteoarthritis of stifles compensatory soft tissue contracture of pelvis, adductors in hind limbs in hip. Neck dysfunction is most likely myofascial and may be related to lack of regular exercise/age or due to compensatory increased weight bearing on forelimbs due to hindlimb dysfunction. Acupuncture Treatments: Treatment was started focusing mostly on hind end. Horse had never received acupuncture treatment previously so started with few points on first visit to assess patient’s tolerance. On September 3, 2018 dry needling with Seirin 0.2 x 30mm needles was done at LI16, ST36, BL26, BL40, and Bai Hui for 15 minutes. The same points were repeated for 20 minutes on September 10, 2018. The plan on the next visit was to add more points on the hind end but I had difficulty keeping the needles in place due to tail swishing at insects. On September 17, 2018 dry needling was done with 0.23 x 30mm needles at GB21, Bai Hui, bilateral BL27 and BL28 for 25 minutes. Bilateral BL40, ST36 and ST35 were treated for 5-10 minutes. Owner was also instructed to incorporate some stretching exercises for the patient’s neck, back, and hindlimbs every other day to twice weekly. Outcomes, Discussions, and References: The owner has not reported any negative issues noted with patient. The owner has reported that the horse has been doing better since treatments started and has put on some weight. No significant change in lameness/way that horse tracks with hind end noted. Unfortunately, time frame may have been too short to assess as it will be important to see how the patient does at his next hoof trimming with the farrier. Results may also be difficult to assess as this animal is not used for riding anymore but general comfort in the pasture can be assessed over time. The plan is to continue weekly to every other week treatments for now. Incorporation of electroacupuncture will also be done in further treatments. Subsequent treatments should target caudal lumbar spinal nerves and femoral nerve (BL23 through BL26), GV4 and try SP6, Xiyan, ST34, SP9, SP10 to see if better results are obtained through addressing myofascial issues in cranial hip/quadriceps region of this horse. Steiss JE, 1989. Electroacupuncture in the treatment of chronic lameness in horses and ponies: a controlled clinical trial. Can J Vet Res. Apr;53(2):239-43.